Investing in a company can be tricky, mostly if you are new to investing and don’t know much on how to value a company or their shares. If you are looking for a way to invest your money, often the best way to do this is by investing in the shares of a company. You will need to do research on the different types of companies and how much you want to invest. Investing in a company can be tricky, mostly if you are new to investing and don’t know much on how to value a company or their shares. However, after proper research, investing in shares of a company can very rewarding. For making your way into being a new investor, you need to understand the ins and outs of investing, such as the difference between a traditional trading account and a Demat account. Other than this, you need to know about the types of share and the share structure of different companies. For example, Google has a multi-class share structure for its Group around the world. But what exactly is a multi-class, dual-class or a single-class share structure? Read on to learn about it! You were probably interested in investing after hearing about the large returns of shareholders on their investments. Well, investing in shares can earn a lot of profit, but it is vital to know all about the market volatility as well. This means that you would also encounter a lot of risk, as shares are subjected to wide fluctuations in the market. Nevertheless, the stock market provides you with excellent possibilities for getting more money on what you invest, given you follow a systematic and correct approach. There is not just one way of enjoying profits by putting your money in the stock market or becoming a shareholder. All you need for getting the desired output is a disciplined strategy, a considerable amount of research and understanding, along with patience. These are highly crucial for creating the best and sound investment plans. What are shares and who are shareholders? To understand what is a share or shareholders, let us understand what a share is. A share is like a portion of the company that are given to investors, who then become the shareholders of the company. In short, a company creates shares (“issues shares”) of stock for representing the ownership claims of the company. The following would give a much better explanation for what a shareholder and shares are. A share is a unit of ownership interest in the financial asset or a company that provides for uniform distribution in the profits of the company (if there is profit) in the form of dividends. Another definition of shares is the units in the corporation which the overall profits of the corporation is divided into. And those who hold these shares are called the shareholders of the company or members of the company. A share is basically a moveable property and can be transferred between different shareholders. Share capital is not refundable unless the business is being wound up or there is a reduction of the capital. And each company has a specific number of shares that is decided upon when it is created. How are “shares” sold to the shareholders? If you are planning to become a shareholder in a company, it is vital to understand that the value of stocks would fluctuate with the business prospects of its operations and the value of the assets that are owned by the corporation. Moreover, you can re-sell your shares as the corporation designs them in a way permitting you to trade and resell them. The first sale of the company shares is called the primary distribution, and if the shares are sold again by the shareholder to another person, it is called a secondary market transaction. This kind of sale primarily transfers the ownership rights from one person to the other, without any involvement of the company who originally issued the shares. To vote for the corporation’s Board of Directors. There can be a small or large number of shareholders, depending on the maximum number allowed in a company, which is also set in the charter. By now, you might know that the shareholders purchase the shares in a company to earn a profit from the business either through the appreciation in the market price of the shares or the dividends given by the company. The shareholders also obtain control over the business by purchasing the shares and have a say in the decision of the company. In case the business is about to be sold or liquefied, the shareholders of the corporation have the rights to any of the outstanding assets over debt. Basically, the creditors are given from the assets or proceeds of the company to cover the debts, and if there is anything left, the remaining assets are then distributed amongst the shareholders as per their relative holdings of ownership of the company. If there aren’t any remaining assets after the creditors have been paid, the shareholders would not receive back money for their investments. Conceptually, shareholders incur high risk in the business they invest in, but if things are going the right way, they can also obtain a handsome profit from an increased value of the company. Now that you have understood all about shares and the shareholders, let us understand the different types of share that are available in the stock market. divide the remaining assets between themselves after the pending debt has been covered if the business is liquidated. Moreover, a company can create different alphabetized classes of ordinary shares like the Class A, Class B, Class C shares, etc. These classes are made for organizing and building different rules for different types of shareholders and the directors to vary dividend payments. prevent an attempted takeover by diffusing shareholding and diminishing the equity of the firm. These types of share are issued on the fact that the corporation may repurchase them someday in the future. The company might even fix the date when they would redeem the shares back. For instance, the company can put a clause that the shares would be redeemed after five years from the day it has been issued. As a matter of fact, the price of redeemed shares are normally the same as the price of the share when it was issued, but not in all cases. This might be a method of creating an explicit agreement with an external investor. Keep in mind though that the shares can be redeemable by the company at any time. This process is normally carried out with the non-voting shares of the staff of the company. This is in case the employees leave their job in that company, and their shares can be taken back by the company at the same value. Non-cumulative preference shares don’t have the rights to obtain or claim the dividends that are foregone. On the other hand, cumulative preference shares permit the shareholders to get the payment before the ordinary shareholder. A cumulative preference share is given in the form of dividends to the shareholders, before the debts are paid off to the creditors, in case the company has liquidated or is falling under massive debt. Moreover, the cumulative preference shares are always paid before any other shareholders are paid their dividends or equity profits. The directors and shareholders have different roles in the company. For a simple explanation, the directors manage the company, and the shareholders own the business by holding the shares of the company. Unless the company articles say so, the directors do not have to be the shareholder, and the shareholders do not have to be the directors. However, private companies often confuse the separation of law between the shareholders and the directors. For instance, when a private company is opened by two or three people, they often call themselves the partners in the business. When in actuality, all three of them are represented in the company as both shareholders and directors. But that is not where things get complicated. The bigger problem arises when there are decisions that have to be taken by the directors in the board meetings and some other decisions that have to be taken by the shareholders by resolutions or written at the general meeting, and these are not followed as per the law. Further, there are some decisions that need to be taken by the directors with the consent of the shareholders. And since the directors and the shareholders tend to be the same people in the private company, things do not go actually per what the Companies Act or the company’s articles of association has given as a law or obligation. What is a share structure? A dual-class share structure guards the founders of the company against takeovers; particularly as soon as the business goes public. The owners who have a long-term view of the business would be protected by the impulses of the shareholders and investors who focus more on short-term gains. The founders would be able to focus on the growth and innovation in the business without the trouble of the shareholders interfering with their vision and goal. Other than the single share structure or a dual-class share structure, there can be a multi-class share structure as well. Let us say a company creates a new class of shares called Class C. And in this class, there would be no voting rights, which minimizes the erosion of the control of the owners over the company. In short, a company can have many classes of shares to make their company evolve better as per the needs of the business. Overall, a company can easily create the share structure that would be best for the firm. This share structure would help the company differentiate between the directors and shareholder’s roles in a much better way. Comprehending the share structure is an important part not only for internal use for the list of share and shareholders, but is equally important for outside investors in determining the value of equity and for due diligence. How well organized your share structure is will also show how well you manage and run your company. 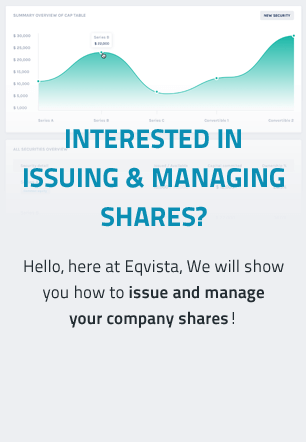 By having an organized share structure, this will show the essential information of the shareholders, such as the total shares outstanding, the shares issued, purchased and authorized to owners and investors. All of this information will be shown in something called a Capitalization Table, or Cap table for short. The Cap Table will function as the master ledger to show all the current share holdings. Having an up-to-date Cap Table will help you manage your shareholding, as well as keep you in compliance with all government regulations dealing with taxes and compensation to your shareholders. Also, investors will review your cap table, and be able to recognize the value of your company, and if there are any areas that require their attention. They will also be able to understand if they invest in your company, how many share they may get, and how this will affect the overall dilution on the shares held by the current owners. For these and many other reasons, it’s important for you to keep an organized share structure and updated Cap table for your company. With a better understanding of what shares are, share structure and shareholders, you now understand their importance in a company and how it would affect the future of your company. With the shares, you would also need a proper cap table to hold all the information regarding how many shares there are, who they have been issued to and how many shares are left to be issued. To understand this better, you need to know all about the cap table. Check out the next article for this!